According to the US Geological Survey (USGS), the global production of Lithium excluding US reached 43,000 metric tons in 2017. This is a significant increase over 38,000 metric tons Lithium production in 2016. This should be added with the unreported US production, which is likely somewhere around 870 metric tons annually. The global demand for Lithium in 2017 is estimated at 41,500 metric tons, presenting a significant growth over demand of 36,700 metric tons the previous year – mostly due to rapid expansion of Li-ion battery production facilities. Figure 1. 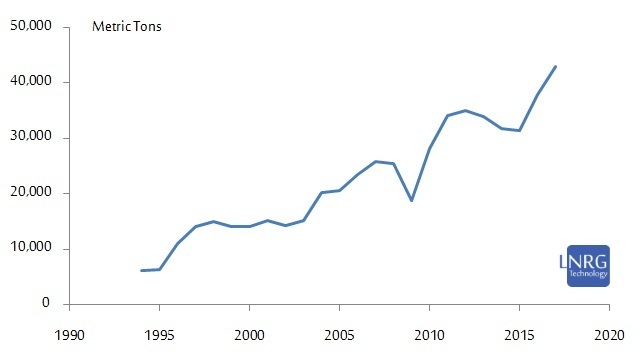 Lithium production worldwide (excluding US) 1995-2017 in metric tons, according to USGS data. The main question is for how long this expansion is set to go on before reaching its peak, as Lithium resources in Earth's crust are limited. The latest USGS estimate for available Lithium reserves and resources is 16.0 million and 47.0 million respectively, an increase from 14.0 million and 46.9 million metric tons respectively reported in 2017. Theoretically, with current production rates, known reserves would be sufficient to sustain production for over 300 years, while resources can prove sufficient for more than a thousand years. This is however an over-simplification, disregarding the rapid production growth and dynamic market constraints. Using a strictly mathematical predictive analysis on actual raw Lithium production data set of 1995-2017, while disregarding the possibility of processing the total estimated volume of resources, the peak production of Lithium is to be expected in the 2040s. This latest estimate is taking into account the updated Lithium production figures for 2016-17 and is notably furthering the peak from the previous estimate (previously it was estimated at late 2020s). However, assuming that all known Lithium resources are to be mined and processed, the peak production is to be expected only in the second half of the 21st century. 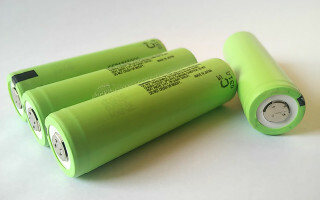 It is evident that Li-ion is due to retain its role as the dominant technology for energy storage in the coming years, but critical outlook on global Lithium resources is important in order to prepare for potential disruptions in this market. The recent shifts in production may contain hints to upcoming Lithium-ion utilization trends and the competitiveness of alternative battery technologies.